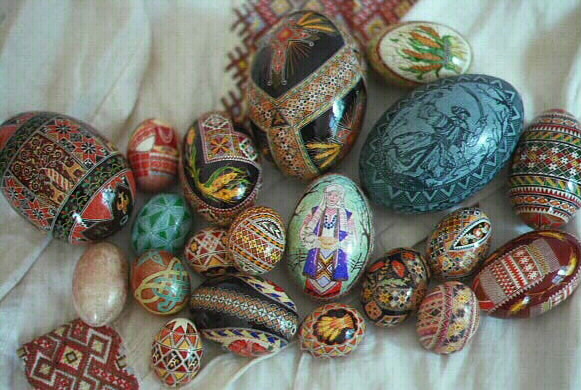 Ukrainian Pysanky (Easter eggs) are an ancient form of Ukrainian folk art. They are an integral and cherished tradition in every Ukrainian household. At the Pysanky Showcase we offer a wide selection of pysanky in traditional, contemporary, and custom designs. All designs are available on assorted types of eggs and can be viewed through the side menu. All eggs displayed on this site are done in the traditional Ukrainian method of waxing and dyeing. © Note: It is illegal to copy, reprint or reproduce in any form, electronic or otherwise, any of the images or portions of the images shown at this website without consent. For personal or commercial use of any photographs or designs, please contact the owner. HTML Translation, including ribbons and icons by GBarkman Art & Design © 2002-2009 GBarkman. Egg Images, Designs & Text © 2002-2009 P. De Angelo. "All Rights Reserved".